Miyako – The Miyako Shimojishima Airport Terminal officially opened at 8:00 a.m. on March 30. With the opening, the “second aerial gateway” to the Miyako region will begin operating in earnest. The terminal had an opening ceremony as well as a Miyako Shimojishima launch ceremony for, the Low-Cost Carrier JetStar, with countless people from Okinawa and the city of Miyakojima in attendance. Shimojishima Airport has a 3,000 meter-long runway, and was first developed in 1979 as a training ground for pilots. In1980, there was a route that opened up between Naha and Shimojishima, however it was suspended in 1994. Thereafter, the number of training flights began to decline, and the airport became dormant. 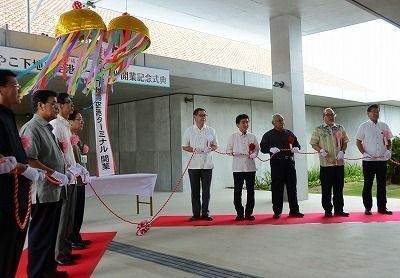 In order to find a use for the airport, Okinawa Prefecture began to court private businesses, and Mitsubishi Estate (Junichi Yoshida, President) signed an agreement in March of 2017, and began constructing a new terminal. Passengers being greeted by the Miyakoshima Tourism Committee after disembarking from the airport’s first arrival. 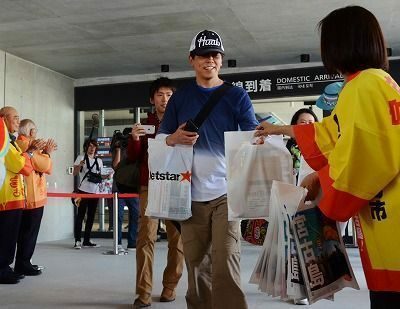 The inaugural JetStar flight from Narita International Airport touched down at 10:55 a.m. At the arrival gate, there were representatives from the Miyakoshima Tourism Committee and JetStar applauding and playing the sanshin, giving a warm welcome to the passengers. The passengers had surprised and happy expressions as they passed through the arrival gate. Then, the return flight bound for Narita was boarded by passengers including Mayor Shimoji, and they were seen off by airport staff at noon. 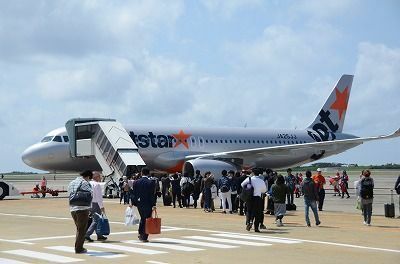 In addition to the regular route run by JetStar Japan between Narita and Shimojishima, the same company has plans to start a route between Kansai International Airport and Shimojishima July 3 this year, and a Hong Kong-based LCC, Hong Kong Express, will launch a route to and from Hong Kong July 19. Additionally, the major Korean airline, Korean Air, plans to start using the airport for chartered flights in June.